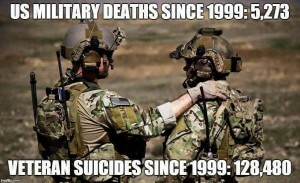 War Casualties & Vet Suicides! Save Lives at Home & Abroad! The U.S. has been waging endless wars in seven countries resulting in an estimated 4 million Muslim deaths in the Middle East and Northern Africa, not to mention widespread chaos in the region, and millions of refugees fleeing to Europe and beyond. In the Vietnam war, more than 58,000 Americans were killed in combat and estimates say 3-4 million Vietnamese were killed, two-thirds of which were civilians. As many as 200,000 U.S. Vietnam veterans have committed suicide, more than three times the number that died in combat. 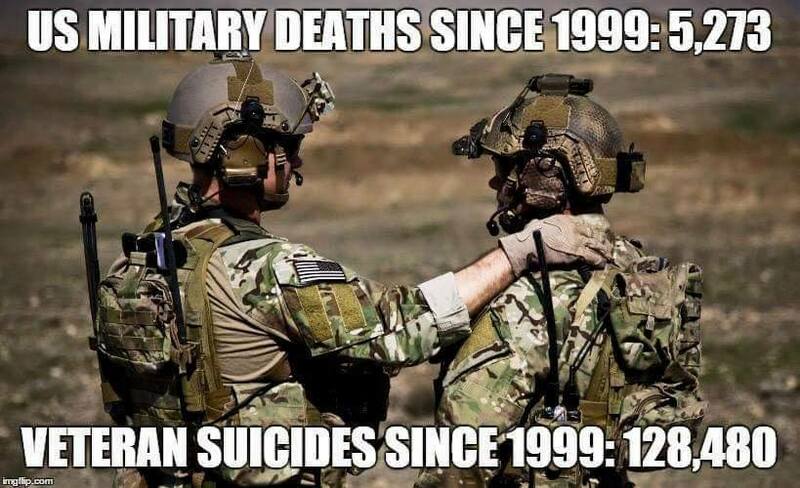 Overall, 22 U.S. veterans commit suicide every single day. Recent studies have suggested that those who served in recent conflicts are 30 percent to 200 percent more likely to commit suicide than their ­non-veteran peers. Help Heal the Wounds of War! Hawai’i Center for Food Safety and GMO FREE Hawaii Island encourage you to attend a free evening presentation about pesticide-promoting genetically engineered (GE) crops in Hawai‘i, and the impacts of the pesticide-seed industry on our families, farms and food. The keynote speaker will be Dr. Ashley Lukens, director of the nonprofit organization Hawai‘i Center for Food Safety, who will share key findings from the organization’s groundbreaking report Pesticides in Paradise. 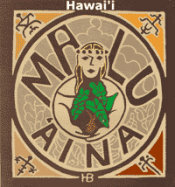 For more information please visit the Hawaii Center for Food Safety Website at www.HawaiiCFS.org or call our office at (808-681-7688. UCB is located just inside the main entrance to UHH from Kawili St. and parking is free. Pope Francis — the Unthinkable and Unspeakable! I would not be surprised in the least if the CIA and other U.S. vested interests involved in the Kennedy and King assassinations also assassinated Pope Francis. In their view he is the most dangerous man on the planet — standing for peace, justice and the environment — condemning capitalism, the arms industries, wars, and calling for justice for the poor and strong action to prevent climate disaster. The capitalists of empire, including the arms makers, oil companies, and their fellow warmakers hate this guy. Watch out for some patsy, and the phony claim of a Cuban, Muslim, etc. “lone assassin.”I pray that I am wrong but history tends to repeat itself. They kill the prophets! During his US visit this week, Pope Francis has been challenging us to end the violence of poverty, war, and environmental destruction. Many of us, as part of Campaign Nonviolence, have been taking this same message to Washington DC and to the streets of every state. Our Hilo Peace Vigil is a vital link in a chain of more than 350 actions which have been speaking out against additional forms of violence—racism, gun killings, nuclear weapons, executions, police brutality, and mass incarceration. In Hawaii alone, there are more than a half-dozen events on four islands connected to the campaign. Gandhi called nonviolence “the greatest and most active force in the world … a force superior to all the forces of brutality.” It is the spirit of nonviolence that inspires and moves us today as we stand in this place—that same spirit, under the name Kapu Aloha, which motivates the protectors of Hawaii’s most sacred mountain – Mauna Kea. For Peace, Justice & the Earth!